Your busy schedule can stay front and center when it’s time to research travel options, thanks to the latest update to Hipmunk’s mobile app for searching flight and hotel reservations. 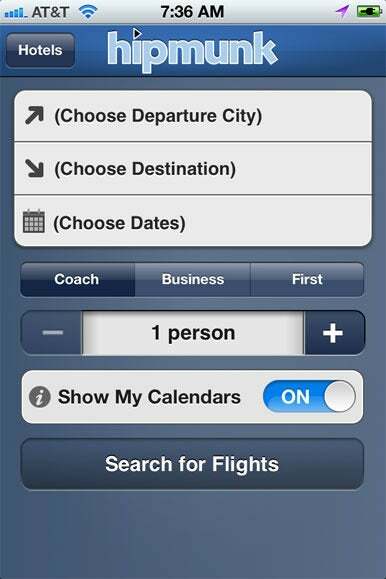 An on-off toggle lets you integrate calendar data into Hipmunk’s flight and hotel search app. Version 2.2 of Hipmunk Flight & Hotel Search, released Thursday, brings your mobile calendar into the app, so that you can see if flight times conflict with appointments or find hotels near any scheduled events. The calendar integration feature works with iCal, Google Calendar, and Microsoft Outlook; it mirrors a feature Hipmunk added to its web-based search tool last October. After spending some of the morning playing around with the new version of Hipmunk’s app, I found that the new calendar integration really is seamless. Getting your calendar data into Hipmunk is as easy as flipping on a Show My Calendars switch that appears on the search page for both flights and hotels. Hipmunk will recognize any calendar events stored on your iOS device. When you search for flights, Hipmunk’s Gantt chart-style results page still displays results that show the length of the flight as well as legs and layover times. But now vertical lines appear on the chart to represent calendar events. 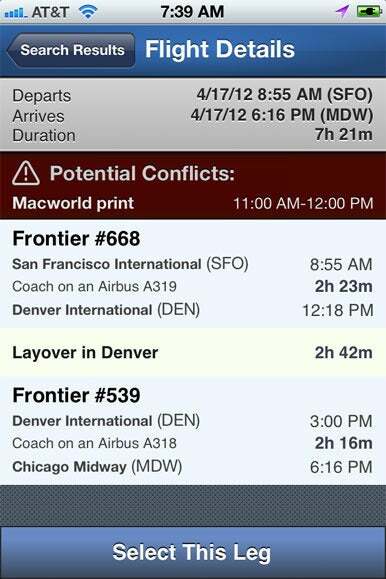 It’s a handy way of seeing if that flight from Chicago conflicts with that meeting you’ve already got scheduled. If a flight you’ve selected conflicts with a calendar event, Hipmunk will include a notification on the flight details page. 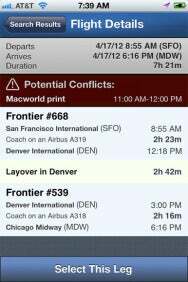 Select a flight that happens to be in the air at the same time as one of your events, and Hipmunk will see to it that you know about the potential conflict. A notification appears on the Flight Details page alerting you of the previously scheduled event. Hotel searches also incorporate calendar events, if you’ve included location information in those events. As before, a hotel search turns up a map with color-coded dots representing Hipmunk’s best bets for hotels in a specified area. (The colors reflect the going rate for a room, with green dots representing the lowest-priced options and red showcasing rooms aimed at the jet set.) But now, calendar icons appear on the map as well, tied to the location of scheduled events. In an especially nice touch, the icons even display the date of your event. By displaying where your events are located relative to nearby hotels, Hipmunk gives you the ability to book accommodations near the activities you’ve scheduled for your trip. For a more detailed view, tap on that calendar icon—the app produces a list of hotels, arranged by distance from the event. Hotel searches in Hipmunk can now find hotels near where you have activities scheduled.